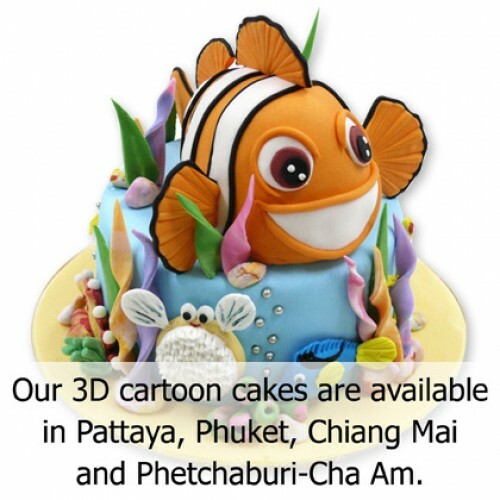 Big Nemo Cake free delivery in Pattaya, Phuket, Chiang Mai, Bangkok. Big Nemo 3D Cake - 3 pounds choose from chocolate or vanilla flavor. Free delivery in the city areas of Pattaya, Phuket, Chiang Mai, and Bangkok. We also have more 3D cartoon cakes to choose from. Please click here " 3D Cartoon Cakes " *** or at the top menu. We can do custom made cakes. Please email us with sample pictures for the cake that you like. We specialize in making luxury cakes individually designed for every major event. We are looking for inspiration everywhere: in art, music, architecture, lifestyle, and everywhere around us. But the main inspiration is you! Each cake is designed to match the occasions for which your personality is created and expressed. Cake from us can be playful, elegant, romantic, minimalist or crazy but never boring! - Please order at least 2-3 days in advance.